Whether it’s a Weekend Wrap Up, Free Shirt Fridays, or Top 10 Tuesday, I’ve found it’s often very helpful to introduce a regular feature on your blog. Now, a lot of people use the quick link posts as their regular feature and that’s fine, but in my opinion that’s selling yourself short and I’ll tell you why. A regular feature or “column” type post will do few different things for your blog. It will create anticipation amongst your readers, help develop accountability in your blogging, and, if done well, become something your blog is known for. It doesn’t take a genius to realize those are all things you want, the question is, how do you make sure your regular feature accomplishes all those things? Obviously if you want to achieve anticipation among your audience, your regular feature needs to be either very entertaining, very controversial, or extraordinarily informative. A perfect example of this is NBC’s Must See TV. 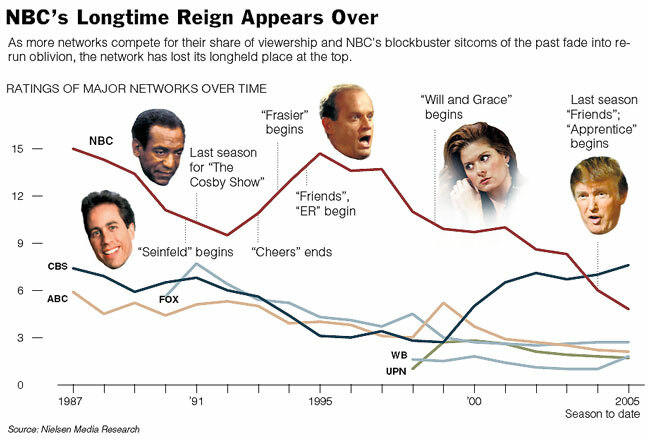 In the mid 90’s NBC ruled supreme as the top network on TV. Much of their success was driven by their fantastic lineup on Thursday nights which was dubbed, Must See TV. Propelled by Friends, Seinfeld, and ER, the lineup created a night of TV that many in fact felt they must see. Now, with Friends and Seinfeld both gone and ER on its 153rd new cast member, Thursdays on NBC, while still called Must See TV, don’t even approach their former success. So how does this all pertain to blogging? My point is, it doesn’t matter how regular your feature or column is, if it’s not of the highest quality, it won’t be something your readers look forward to. On the other hand, if you succeed in making it something your readers just can’t wait for, it can propel your entire site to success. Continuing to use the TV analogy, whether it’s a good one or not, can you imagine if in the middle of sweeps week, NBC just couldn’t get a show on the air? Maybe they were busy, maybe the shows didn’t come together just the way they had hoped, or maybe somebody had gone on strike. Whatever the cause, it would have been a disaster, and even more importantly, everyone at NBC knew it would have been a disaster. They did whatever it took to get those shows on the air. Now of course they film TV shows well in advance of actually airing them but that’s not really my point here. If you establish a regular feature that your readers are looking forward to, you’d better deliver. Tying your feature to a day such as White Board Fridays, gives you a clear deadline. Your readers know when it should be posted, and you know they know it. That kind of back up against a wall, gotta get this post out no matter what, is exactly what creates the accountability factor. It’s one thing to set goals for yourself or deadlines for yourself and then miss them. No one else but you knows you blew it. There’s just something about other people (namely your readers) knowing that you blew a deadline, or didn’t deliver on a promise, or missed your goal that will help propel you forward and make you work that much harder to come through in the clutch. Last but certainly not least, is the branding opportunity a regular feature presents. For whatever reason I’ve apparently got television on my mind (I don’t even watch that much TV, so I’m not sure what this is about) but it presents another great example. How many people can tell me who does the nightly Top 10 List? If you have any sense of humor at all you’ll immediately smile as David Letterman comes to mind. For online examples, anyone in the SEO industry automatically knows White Board Fridays are a feature of SEOmoz. The same with affiliates and Free T-Shirt Friday… Shoemoney and his big bald head immediately come to mind. So, whether your regular feature is something fun, entertaining, or just more informative than usual, just make sure it’s something that your readers will look forward to. Not only will you have a preset topic to write about but you’ll be developing your accountability in terms of your blog, and hopefully improve and expand your blogging efforts, all by simply introducing a regular feature to your blog. great idea, the best idea I have gotten to improve my blogging in a very long time. Jamaipanese, thanks for the kind words! I’m glad you liked the post. If you notice, I don’t have a feature for this blog yet either. I’ve got one solid idea in the hopper, unfortunately, it’s a bit dependent on my site being older and there’s not a lot I can do to speed up time. I am kicking around another idea that I’ll probably give a shot sometime next week to see how it goes. While you don’t want to start these haphazardly (the more thought and preparation you put into them, the better the chance they’ll succeed), you also shouldn’t feel bad about a feature not working out. Just dust yourself off and try again as the saying goes.